Home › Home and Kitchen › Chefaith 5-Blades Kitchen Herb Scissors [Blunt-Tip Kids Scissors As Bonus] - .. STYLISH DESIGN - Super sharp 5 stainless steel blades allow you to cut herbs with ease in seconds. Ergonomic anti-slip silicone coated on the handle provides soft and comfortable grip every time you use. Scissors won't slip when wet, extra safety! MULTI-USE & BIG TIME SAVER - Perfectly to be used for cutting, chopping and mincing herbs, onions etc. 5 times FASTER than regular scissors! EASY TO CLEAN & STORE - Simply rinse the herb scissors in warm soapy water or throw it in the dishwasher (hand washing recommended). Protective SHEATH as BONUS for safe storage and doubles as the perfect cleaning tool. PREMIUM QUALITY & ULTRA DURABLE - 304 grade heavy-duty stainless steel blades, 100% rust & corrosion resistant. Silicone material used is non-toxic, FDA compliant and BPA free, heat resistant up to 480F. High quality materials guarantee a long-term usage that will last years. SPECIAL PRICE - Premium kitchen herb scissors at this SUPER-LOW price for a LIMITED TIME ONLY. Please search "chefaith kitchen utensil" for other special offer products sold by Chefaith. Need some fresh fun in your kitchen? Chefaith would be pleased to bring ourKitchen Herb Scissors / Shears (5 Stainless Steel Blades) to you when you'regetting bored of daily cooking/baking etc. 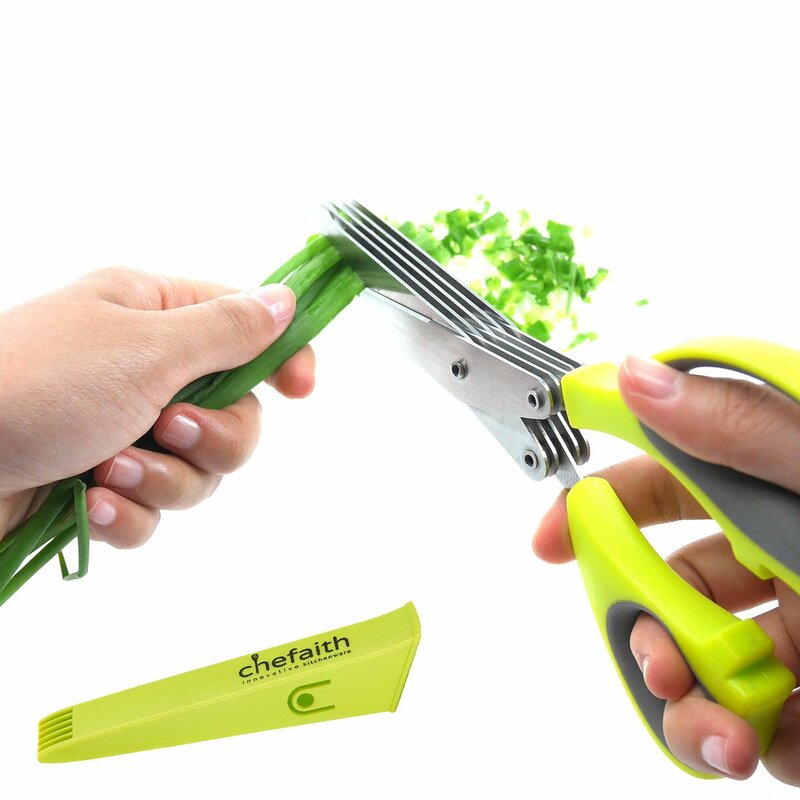 Why Chefaith silicone kitchen herbscissors? - Ergonomic design & classic outlook - Dishwasher safe and easy toclean - Anti-slip silicone handle for superior grip - Extra sharp 5 stainlesssteel blades for quick cutting, chopping and mincing herbs - 304 Gradestainless steel used, 100% rust & corrosion resistant - Non-toxic, FDAcompliant and BPA free silicone for long-time use - Best / perfect holiday /birthday gift for your friends and family - Super low price for a limited timeonly, don't hesitate to save money NOW! Package includes: -1 x ChefaithKitchen Herb Scissors (5 Stainless Steel Blades) -1 x Protective Sheath -1 xBlunt-Tip Kids Scissors Kitchen is the place where all delicious food comesfrom for our families. It's also the source of happiness in our daily life.When you're hungry, a simplest meal from your Mom's hand is literally the mostdelicious food in the world. Thus, Chefaith would always want to add some cute/ attractive / interesting kitchen utensils / gadgets with high quality andaffordable prices to your kitchen to save your food preparation time and makeit much more fun! Life is not easy, but we could make it more colorful!